City Council majority leader demands "immediate" action from DOT after two horrific crashes in as many weeks. Van Bramer spoke this morning at the corner of 43rd Avenue and 39th Street alongside Flor Jimenez, whose husband Gelacio Reyes was killed by a drunk, unlicensed hit-and-run driver while biking home from Manhattan on April 1. Ten days later, a turning box truck driver critically injured cyclist David Nunez, 27, at the same location. The painted bike lane on 43rd Avenue is the primary eastbound connection for cyclists headed from the Queensboro Bridge and Long Island City to the protected bike lanes on Queens Boulevard. There’s no official count, but it’s likely that hundreds of people use the street during the p.m. rush. Van Bramer said DOT should take “immediate” action to study “not if, but how” a protected bike lane can be installed on the corridor. He also called for leading pedestrian intervals at the intersection where Reyes and Nunez were struck, which is just feet away from the district’s largest senior center. YES this would be amazing–in addition to these recent events, this is indeed an easily fixable gap in an otherwise physically protected network beginning in Elmhurst, continuing all the way across the bridge into Manhattan and then along 1st and 2nd ave (well, kind of). Let’s just make sure any solution on 43rd Ave is two-way, and if not, that Skillman Ave, the Westbound complement, gets the same treatment! The north side of Skillman would be a great location for a two way bike lane. From experience my impression is that there is less traffic on Skillman then 43rd and could be a one lane street even during rush hour. Also, with the railyard there are fewer intersections to negotiate. I used to use this lane coming home from school and work at all hours of the evening/night. I would love to see a protected lane come in! My ideal scenario would be to eventually have protected lanes going to/from Queensboro Plaza along Queens Blvd to Forest Hills, and Skillman/43 to Flushing, and beyond. Van Bramer Demanded Protected Bike Lanes on 43rd and Skillman. He’s Been MIA Ever Since. Now contemplating a run for borough president, the western Queens council member has gone silent about a major improvement for the borough's bike network he endorsed last year. Cyclists are vulnerable to motor vehicle traffic on these two streets, which should be safe connections between the Queensboro Bridge and Queens Boulevard. Last April, Van Bramer stood next to a grieving widow and called for a protected bike lane on 43rd Avenue. DOT produced a plan, but Van Bramer refused to support it. In April, a drunk driver killed Gelacio Reyes, 32, on 43rd Avenue at 39th Street as he biked home in the early morning from work in Midtown Manhattan. 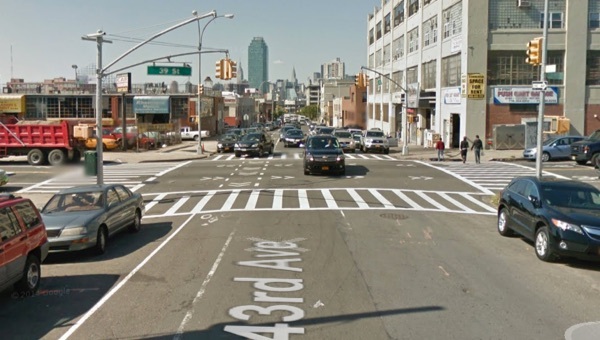 Now advocates are renewing their call for DOT to install a protected bike lane on 43rd Avenue and its westbound counterpart, Skillman Avenue, which connect the Queensboro Bridge to the protected bike lanes on Queens Boulevard. Protected Bike Lanes on 43rd and Skillman Will Make Woodside Streets Safer. Will Van Bramer Support Them? Van Bramer called for adding protected bike lanes on 43rd and Skillman, but after DOT proposed doing exactly that, he hasn't endorsed the plan.